Today again we avoid the distortion type of effects. 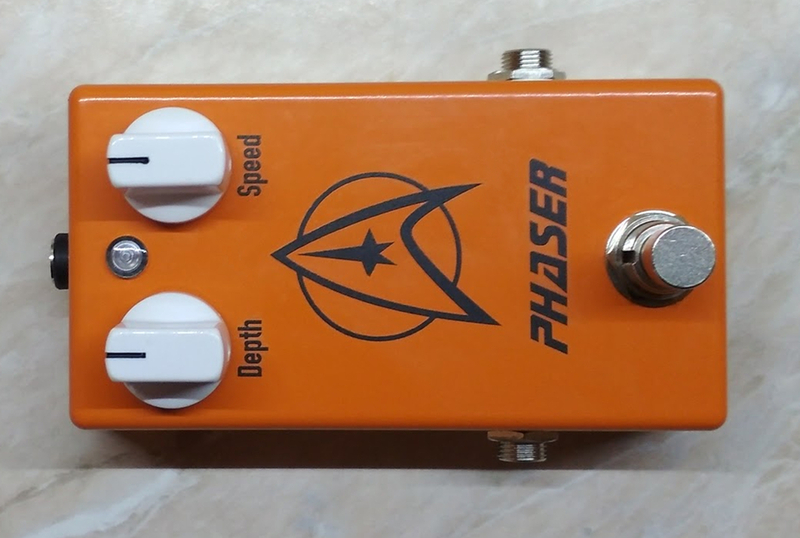 We never had a phaser here on the blog, so today we have one: the well known MXR Phase 90. Let’s have a quick overview of the different types of modulations. The amplitude modulation is the most simple: the amplitude of the signal varies according to the modulating signal. This is what happens in tremolo effects. Frequency modulation is a bit more complicated: here the frequency (pitch) of the signal changes in accordance with the modulating signal. This is what a vibrato does. But what is phase modulation? Shifting phase is simple: we only delay the signal in time. But if the modulatin signal is not a constant, but varies in time, thenthe phase shifting varies in time too and as an endeffect we get something similar to the frequency modulation. At the end this would be again vibrato. In phasers this wet signal is mixed with the original signal which causes the typical sound. The logic behind is described really well on R.G. Keen’s webpage if you are interested in a more in depth explanation. And now some words about the sound of the Phase 90. It is not overly emphasized, but still goves you enough depth and space. With my version’s depth pot it can be put really in the background, so that it just gives a little extra taste to the sound. With the depth pot fully turned up (which would be the same as the original) its presence is there, but still not that strong as for example a Small Stone. It is a “must have” for any Eddie Van Halen fans, but I use it in stoner type of music too sometimes for getting a richer spacious sound. A detailed analysis can be found on ElectroSmash’ website. Here I only would like to mention that the JFETs need to be matched. R.G. Keen gives a thougrough description of the process on his website, but you can get matched quads at many webshops (Musikding or Banzai in Europe or Smallbear in the US). The original calls for 2N5952, but since these are expensive and hard to source I have tried the J202s that are still pretty cheaply available. I used them with great results without modifying the circuit. – Script/box logo mod: the effect has two major versions, the “script” and the newer “box” logo versions. The R14 feedback resistor was introduced with the latter one. You can make it switchable or replace it with a pot wired as a variable resistor. Just experiment what you like the most. – Phase 45 mod: the Phase 45 is a similar effect, but only has two phase shifter stages instead of the four that the Phase 90 has. If you take the signal from the output of IC2.2 and put it to R22 you actually get a Phase 45. With some modifications this can be made switchable too, but honestly I don’t see much use of it. The only really big difference in sound between the two versions is the intensity of the effect, and with the depth mod you can already regulate that with the depth pot.